Another fantastic result from First Solar (FSLR)... they keep justifying their sky high valuation [Jun 17: Energy Conversion Devices Now Trades at Par with First Solar] This is one of the few names in the space not constrained by the polysilicon shortage and they've taken full advantage of it. We don't own this name anymore but I added a bit to Energy Conversion Devices (ENER) today (also not affected by polysilicon prices) earlier in the day in anticipation. 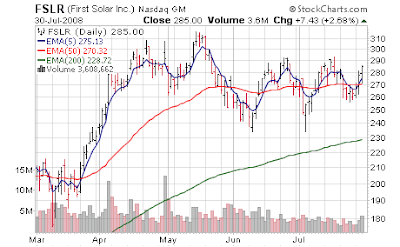 First Solar has yet to really disappoint in its public life, unlike its brethren, some of which make it a habit to do so. I won't name names to protect the innocent. We'll see how the stock reacts, but on a cursory glance of fundamentals, everything looks quite juicy. Remember it's not the news, but the reaction to the news. Keep in mind analysts estimates $217M revenue, $0.58 EPS. Much like the fertilizers at some point you get so large the PERCENT increase cannot keep up with previous quarters, but the magnitude of the numbers are still impressive. If all I did was read earnings reports of stocks we own or follow in our sectors you'd think this market would be at Dow 20K! They do have one of the shortest press releases out of any company I follow - short & sweet. Astounding 36% sequential revenue growth, and 247% year over year growth. For earnings the numbers were 49% sequential growth (wow) and some mind numbing number that blew up my calculator when you do year over year (excluding tax benefit) Gross margins now up to 54% from last quarters 53% - staggering in comparison to polysilicon based peers. I keep thinking this stock is too expensive and "next quarter" will be the one where expectations get too high and it will fall flat. First Solar keeps telling me "No soup for you". Bravo. Only fly in ointment is no guidance so everyone has to hold their breath to see what they say so the market lemmings can react violently one way or the other the minute it is uttered. Net income for the second quarter of fiscal 2008 was $69.7 million or $0.85 per share on a fully diluted basis, compared to net income of $46.6 million or $0.57 per share on a fully diluted basis for the first quarter of fiscal 2008. Net income for the second quarter of fiscal 2007 was $44.4 million or $0.58 per share on a fully diluted basis, which included a one-time income tax benefit of $39.2 million that resulted from the reversal of valuation allowances against previously established U.S. deferred income tax assets. Classic double bottom formation - why didn't my on staff technician notify me? Wait, I am the on staff technician. Bah.